Historically, JUnit has not elegantly supported verification of expected-exception messages in unit tests. Some time ago, I wrote a post about techniques for handling this situation. Brian Brooks (clearly a diligent web searcher) found that post and was kind enough to send me a message pointing out that the latest version of JUnit, 4.7, finally includes support for this incredibly important and common testing scenario. * when checking an exception message. Very useful. Thanks to Kent Beck for adding this support. I had to use java.net.URLEncoder yesterday. This experience was a great reminder of how annoying this API is. It demonstrates a couple of issues, so I thought I would comment on it here. The first thing you can see here is how important it is to get the API right the first time, lest things go downhill from there. In its original form, URLEncoder provided only one static method which encoded a string as "application/x-www-form-urlencoded" (suitable for issuing an HTTP request). This method has the signature encode(String), and it used the platform's default encoding. Unfortunately, this is technically hazardous, because URL encodings are supposed to always be UTF-8. Therefore, wiser heads built and used replacement classes (such as URLCodec from Apache Commons). Java 1.4 finally "fixed" this deficiency in the platform with a new encode(String,String) overload, the second parameter being the name of a character encoding to use. The old encode(String) method is marked as deprecated. The documentation itself states that: Note: The World Wide Web Consortium Recommendation states that UTF-8 should be used. Not doing so may introduce incompatibilites. I don't know, but I'm guessing that the powers-that-be would have liked to make encode(String) do UTF-8 encoding. But they felt constrained by the legacy decision to use the platform default, in the name of not breaking any existing code. Never mind the substantial odds that any such existing code is already broken in this case wherever the default encoding is not UTF-8. But wait, it gets worse. The encode(String,String) method also throws UnsupportedEncodingException whenever (surprise!) the second parameter does not refer to a valid encoding. I'm no rocket scientist, but it seems to me that if you're following the W3C recommendation and always passing UTF-8, you don't have to worry about this exception being thrown. And yet because the exception is checked, you have no choice but to handle it and clutter up your code, perhaps with a catch block that just does assert(false). I have been gradually making my way through "How to Think About Algorithms" by Jeff Edmonds. I have recently recommended this book to several people, and I wanted to mention it here, too. Edmonds uses what I'll call a more intuitive approach to algorithms that I think would be appealing to those with an engineering mindset. Here I'm constrasting it with the texts that I've used as a student in algorithms courses -- the classic Sedgewick and CLRS books. The less I leave the IDE, The more productive I can be. This seemed like an obvious enough desire that somebody would have built a plugin for it already, and sure enough, a search turned up a couple of different examples. The one that I went with is called NTail. It works like a champ. It also has a few extra nice features, like the ability to highlight lines in the file based on a regular expression. If this sounds useful to you, I'd encourage you to check it out. Streaming out content that opens in Microsoft Office applications is a fairly common feature in web applications. This involves setting a Content-Type header to the appropriate MIME type. The new XML/ZIP-based file formats in Office 2007 bring with them new MIME types. There is a complete list of those here. Another common technique is to stream XML or HTML and basically lie about the content type to get data presented in Word or (especially) Excel. After all, generating true native Office-formatted files on a web server generally involves third-party components, and depending on your platform and specific needs, those can get expensive. But Excel 2007 creates a gotcha for this use case called "extension hardening", where Excel actually verifies that a file format matches the extension it claims to be before opening it, and if not, gives an annoying, scary prompt to the user. No, this isn't great for production use, but for quick-and-dirty testing, it's much more convenient than creating a launcher batch file / shell script or manually typing a ginormous claspath. Well, this practice jumped up and bit me the other day. After the requisite amount of pain and suffering, I observed that setting java.ext.dirs does not extend but rather overrides the real optional-extension location (at least with Sun's JVM), as sort-of-alluded-to here. As a consequence in this situation, Java will, at runtime, lose track of your optional packages. In my case, this manifested itself as an inability to load the JCA crypto providers (i.e. ClassNotFoundException). If you're not using any of the standard optional packages, setting your own extensions path doesn't seem to matter. But I guess the moral of the story is that you shouldn't count on the extension mechanism to stand in for the classpath mechanism, even in all expedient situations. In the fourth part of this series, I'm finally read to generate strongly-typed wrappers for Java .properties files. If you would like to review how I got to this point, check out the earlier installments here, here, and here. First, a little bit about my code generation philosophy. I prefer to only generate specializations -- the things that will actually vary from model to model -- when possible. Inheritance works well for this: I can put common functionality in base classes and generate subclasses. This cuts down on the amount of code that I have to work with in the template. As an added bonus, the base class can be tested (and perhaps even used) independently of the code generation process. With that in mind, I will start by creating base classes. Recall that my PropertySet is defined as supporting two different "load types" -- resource bundle and classloader resource. That means two base classes, which I will call ResourceBundleProperties and ClassLoaderResourceProperties. Since my goal is to demonstrate openArchitectureWare, model-driven development, and code generation, and not to write the be-all-and-end-all of .properties file loaders, this code won't support everything you can imagine. Generally speaking, I'm following the tried-and-true approaches described here. 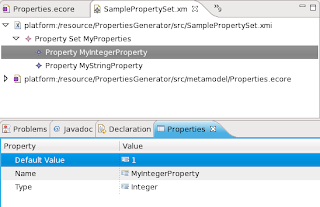 * Load the properties from the resource bundle with the given name. Next I create a code generation template (an .xpt file, written in the oAW Xpand template language) to create a subclass based on the information in PropertySet models. While not quite as simple as the template I presented last time to generate sample .properties file, this is still pretty straightforward. Notice how I determine which base class to extend using the value of LoadAs defined in the input model. 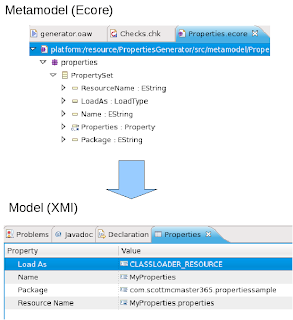 The last two Xpand templates for Property generate overloaded getProperty() methods, with and without the default value. And that's just about it. If I want to use my new properties wrapper in a real project, I will need to pull in all of the files from this project and add some sort of "generate" target to my Ant build which uses the oAW Ant task to invoke generator.oaw. I should point out that there is a notable overhead involved in spinning up the oAW code generation pipeline, and if you have to do it multiple times per build, your build process can slow down considerably. It is therefore beneficial to consolidate into as few model files (.xmi's) as possible. So a possible enhancement to what I have done here would be to metamodel a class which is a set of PropertySets and then enhance my Xpand templates to generate multiple files, so that I can cram more than one PropertySet into a model. I hope that after reading this series, you're ready to run out and EMF, oAW, modeling, and code generation. If you do, please share your experiences with me, because I'm always looking out for new techniques and best practices. Last time I created a sample model using the Properties metamodel that I built in the first post of this series. Now I'm going to put it all together and actually generate something with openArchitectureWare -- not Java code just yet, but rather, a sample .properties file which can be customized and loaded using the Java code that I'll create in the next entry. PropertySet must have a name. I will use this to generate the Java class name. PropertySet must have a resource name. This will tell me what file to load at runtime. Properties must have a name. This one is pretty obvious. The "import" line pulls in the Properties metamodel. Marking these constraints as "ERROR" stops oAW processing with the specified message when such a condition is encountered. The rest of the code is pretty intuitive. Later, when I talk about oAW Workflows, you'll see how this gets wired into the generation process. When I finally run this in the next section, it will generate a file in .properties format with each property in the model. 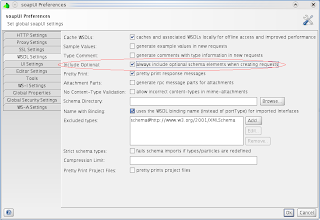 The file is named based on the value of the ResourceName attribute of the PropertySet. It is suffixed with ".SAMPLE" because presumably it would be customized in a real application. In my next post, I'll use Xpand to achieve the ultimate goal of this project, namely, to generate some Java code to load and wrap these properties. First, though, I need to tie everything together so that the oAW generator can run. In a more serious implementation, the execution of the .oaw file would be integrated in an Ant build using oAW's custom Ant task. For this project, I'll just use the oAW Eclipse runner. Now I actually have a working code generation pipeline set up. To conclude in my next post, I'll write a slightly more sophisticated template to generate Java code, and maybe talk a little bit about code generation philosophy. Previously I demonstrated how to create an Ecore metamodel describing Java .properties files, with the ultimate goal of using openArchitectureWare to build strongly-typed accessor classes for my properties. Before I start writing oAW templates, though, I want to have a sample model that I can work with which is relatively simple but still exercises most of the breadth of my metamodel. The oAW sample project contains a model already called "Model.xmi". The "xmi" is "XML Metadata Interchange", an OMG specification concerned with interoperable models, and the default format for models in Ecore/EMF. I will delete the existing Model.xmi file and create a new model called "SamplePropertySet.xmi". One way to do this is to open the Properties.ecore metamodel, right-click on the class that I want at the "root" of my model (namely, PropertySet), and select "Create Dynamic Instance". Choosing a location in my workspace, away I go. There are a number of other things that I could do with EMF at this point, such as generating a Java object model and "starter" Eclipse plugins for working with my models. But I don't need to do any of that for this project: Starting next time, everything going forward will be in the Land of openArchitectureWare. Last time I showed how to build an Ecore metamodel in Eclipse using the Sample Ecore Model Editor. Ed Merks from the EMF team (whose EMF book is out in a new edition, by the way) commented that I could be using the Graphical Ecore Editor, which is a part of the Ecore Tools subproject. He is absolutely correct. (Thanks Ed.) There are a couple of steps to go through to do that, so I'll talk about those here. First, you need to install the Ecore Tools package, which you can find on the Ganymede Update Site (assuming you're using Eclipse 3.4) under "Models and Model Development". After you do that, you can select File | New | Other in Eclipse, and there will be an "Ecore Tools" folder available. Underneath that, choose "Ecore Diagram". A wizard appears, and you can select your .ecore file as the domain model.